For those of you who follow me on Twitter, I had a bit of a meltdown before I left for the US. Them and their tricksy immigration rules, combined with nondescript instructions on how long you should have left on your passport. You get the idea. Even with all the research I had done, I was sweating as I checked in, sweating on the plane, and when the immigration dude had to "go check with his colleague about something", I nearly had a meltdown. Thankfully, they stamped my passport and I was through. LA is a weird place. I was warned about how spread out it all was, and you can easily travel for streets and not see a soul (apart from the numerous homeless who wander the streets). Very few things are located near each other, and often things which look close together on a map, will turn into a $12 cab ride. Providence is one of these places. A 2 Michelin starred restaurant, it was to be my first eating destination on my trip and arriving early, I thought I would check out the surrounding neighbourhood. There was nothing around it at all. After a few minutes looking for things to distract me, I gave up and headed on in. My first contact with LA hospitality was great. Our server was friendly, knowledgeable and quite refreshing from what I come to expect from much of London. Some might say over friendly, but you couldn't doubt the knowledge he had of all the restaurants products. The restaurant itself is small and looking a little worn on the inside, but still clean and simple with nice little touches. The food is far from clean and simple. Our amuse included the restaurants twist on two popular cocktails, and some extremely tasty morsels. The mojito gelee was a subtle cube of mojito, the "screwdriver" arrived like an egg yolk and exploded in your mouth. The gougere was perfectly executed, and the parsnip soup with bacon broth was quite special. After that quartet, my appetite was fully geared up. We decided to share two "entrees" which couldn't have been more different. 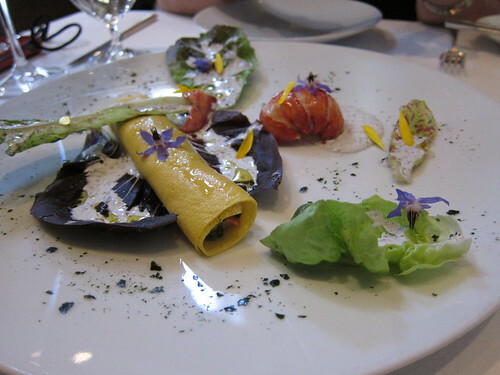 The lobster crepe arrived looking stunning, and tasting pretty great too. With the tail, the crunchy crepe and soft claw, you get a great assortment of contrasting tastes and textures. The clam fritters arrived simply in a bowl with some yuzu mayonnaise on the side, and although the first few were pleasant, they started to cloy. There was no way I could have finished a whole portion of these on my own. My main was something so ridiculously decadent, that it jumped off the menu saying "order me", so order I did. 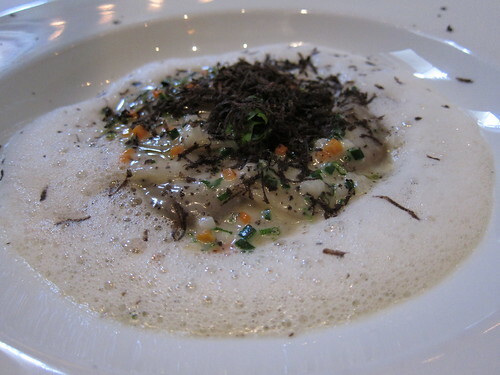 Voila, one plate of foie gras ravioli, served with "aromatics", a parmesan foam and smothered in grated truffle. I hate using the word umami, but this dish was designed to flood your mouth with this fifth taste, and the pasta was just so perfectly executed. Each bite provided me with such pleasure, it ended all too quickly. My companions plate of sea urchin spaghetti is definitely not something I would normally go for, so after a token mouthful, I left her to it. I ended with a coffee "bombe" and a whisky cream, a delightful combination which tasted like a refined tiramisu in the mouth. Opposite me was a dessert a mad scientist would have been proud of. 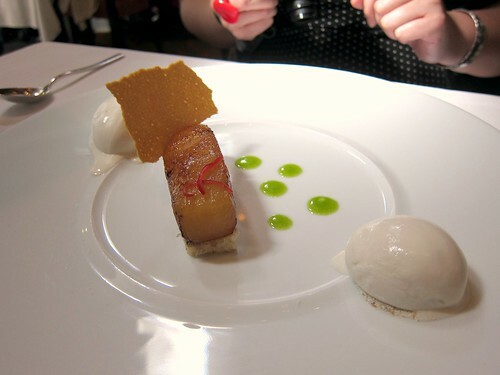 A perfectly caramelised stick of pineapple soaked in white soy with little globules of jalapeno sauce. A dessert which triggers all your savoury senses, with the base ingredients sweetness dragging this dish into dessert territory. Personally, I loved the combination of sweet and savoury, and each additional bite kept me coming back for more. 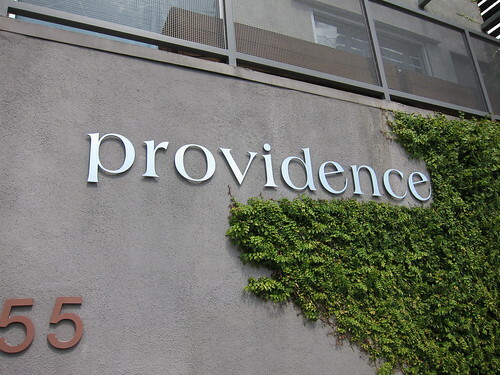 With ambitious combinations and excellent execution, it's easy to see why Providence has been awarded their coveted two stars. A visit to the local Farmers Market (located on 3rd and Fairfax) soon after was probably ill timed. Packed with stalls selling food, it would be a great place to hang out if you are hungry, not so much if you had just devoured a huge meal. 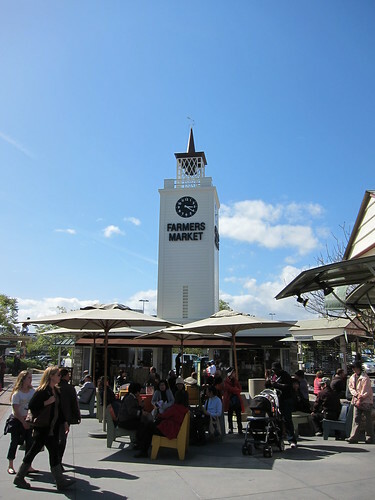 Located right behind is the Grove, an open air shopping center where I didn't buy anything, and just sat in the Californian sun, soaking up rays so rarely seen in London. How did it compare for price with London 2 stars? @Kavey - Comparable I would say. All in (with tip) I paid about $80 which is under £50. No drinks though. Ha, my hands captured forever in your dessert photo. It was a very good meal. I'm glad you enjoyed it. That sounds amazing, but the trouble with foam is that it does look like a chef has carefully sent half an hour gobbing around your plate of food. Completely grosses me out. 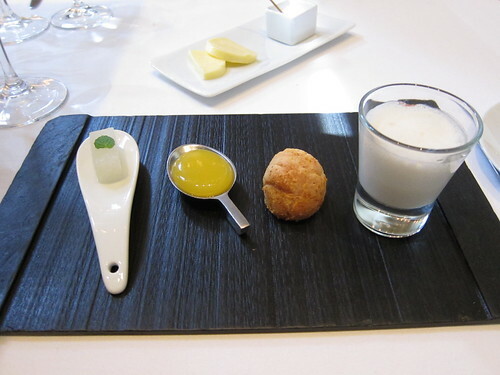 Looks very good especially the amuse! Did you get to do much street food when you where there? 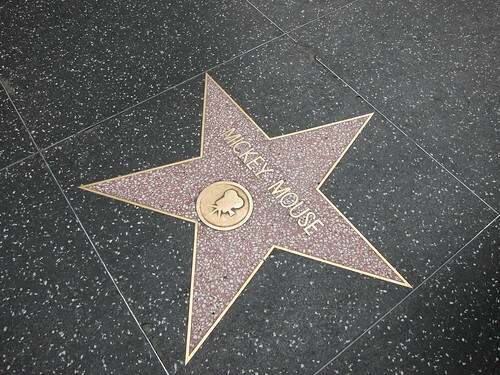 @ Minty - Forever immortalised. You may well be in Animal somewhere too. @G&C - Tasty tasty gob. @ Pavel - No car makes it tricky to stalk the trucks. I managed to get to a taco truck in SF though, which was pretty good. That sea urchin spaghetti sounds awesome. no pic? WAH!